Rheumatism or rheumatoid arthritis is one of the most widespread autoimmune disorders. Though OTC drugs and medications are widely prescribed by medical practitioners, many non-drug natural remedies are found to be more beneficial and effective. Natural’ approaches to rheumatism is getting increasing popular thanks to growing belief in the effect of Mother Nature’s natural remedies. Experiences show that painful flare-ups due to rheumatism can be treated to a great extent by using natural cures and pain relievers. Non-steroidal anti-inflammatory drugs may give instant results, but depending on them is not a wise idea at all, as they have adverse health effects. 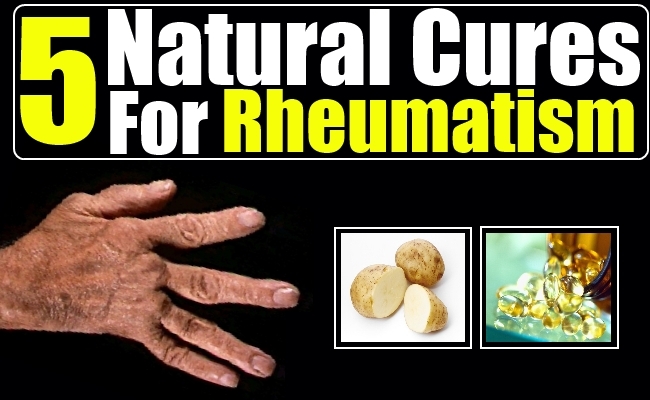 Let’s have a peep into some of the great natural cures for rheumatism, which will leave you happier, healthier, and pain free. Natural cure for rheumatism actually involves a combination of simple home remedies, dietary changes, exercises, herbal remedies etc. Stretching exercises, strength exercises and conditioning or aerobic exercises are said to be the most effective healing therapy for rheumatoid arthritis. Gentle physical exercises are essential in fortifying the muscles around the painful joints. These workouts will also eradicate fatigue and tiredness. If you are suffering from severely harmed joints, it is better to avoid exercises. Walking and gentle water aerobics are ideal for starters. Tai chi is a very effective slow and rhythmic exercise pattern that involves gentle and graceful movements. This therapy enhances the patients’ range of motion and joint strength and helps the sufferers’ to keep their attention away from soreness. This Chinese exercise also gives the effect of meditation, which is essential in driving away tension and relieving pain. Since it combines breathing and movement, even chronic rheumatic patients are able to get relief from intolerable pain. Take care not to exert your body unnecessarily. There are different massage formulas combining essential oils and herbs that relieve pain caused by rheumatoid arthritis. Oils from the seeds of evening primrose, borage and black currant serve as excellent aromatherapy oils. The fatty acids contained in these aromatic herbs help in relieving pain and stiffness. Massaging the affected parts with oils such as, Angelica Essential Oil, Calendula Essential Oil, Eucalyptus Essential Oil, Chamomile Roman Essential Oil, Peppermint Essential Oil, Lavender Essential Oil, Peppermint Essential Oil are found to be effective. There are many essential herbs that are packed with natural anti-inflammatory properties. These herbs are very effective in curing rheumatism. Examples of herbs that cure rheumatism are boswellia or Indian frankincense, devil’s claw, white willow bark, ginkgo biloba etc. Since these herbs might give delayed results, long-term and continuous use is necessary. Dietary changes are essential to get effective relief from rheumatism. A low-protein, high-carbohydrate diet is proven to be effective. Fish oil supplements, omega-3 fatty acids, Gamma Linolenic Acid (GLA) and other essential fatty acids are great in curing this disease. Essential oils from flax seed, evening primrose, hemp, black currant seed; and fatty fishes such as salmon, sardines and tuna are loaded with essential fatty acids. Omega-3 fatty acid is an excellent natural anti-inflammatory, and hence will be helpful in healing rheumatoid arthritis pain and stiffness. Consumption of refined sugars, milk, milk products and animal products should be kept to the minimum as they lead to severe inflammation problems. Experience shows that consuming raw potato juice before meals gives much relief from pain. Drinking minced celery seeds mixed in hot water before meals is another natural remedy. Consuming dishes that are made with high quantities of garlic also helps a lot in healing the condition. Cold and hot compresses also help certain patients. Evidences and experiences show that rheumatism in its earlier stages can be tackled successfully by pursuing these natural remedies.